The Launch Pad: Flashback Friday: "Don't Give Up the Moon!" Flashback Friday: "Don't Give Up the Moon!" Welcome to Flashback Friday! 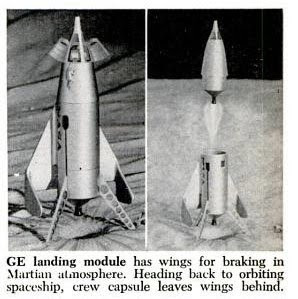 This is a new series dedicated to interesting space-related articles and photos found in retro-tastic issues of technology magazines from the 1950s - 60s. Hope you enjoy. The following excerpts appeared in a letter from the editor of Popular Science in December 1963. The accompanying photo appeared in the same issue, in a separate article. Don't Give Up The Moon! We were in California visiting space industries when The Saturday Evening Post screamed, "Billions wasted on Space!" Mrs. Clare Boothe Luce was calling Apollo "The Moon Mess," a blunder the President was trying to wriggle out of. Six months after Gordon Cooper's flight, economizers and fainthearts were shouting: "Stop the Moon Race!" What -- Popular Science asks -- is wrong with a race? A lot of the world's progress has come about through races. ...Our railroads raced to cross the continent. Peary beat Amundsen, the Norwegian, to the North Pole. Amundsen beat the British to the South Pole. Lindbergh out-raced Chamberlain, Byrd, and the Frenchmen. The Post said we're going too fast, not testing carefully. How could anyone tour a space facility and come to that conclusion? At the Jet Propulsion Laboratory 2,000 engineers, scientists, and technicians seem to be testing - if you include all the supporting activities - one little probe, Ranger 6. At Santa Susana, 19 stands are test-firing Rocketdyne engines. At North American, 15 "boiler plates" of the Apollo capsule are being dropped, heated, cooled, and subjected to every torture engineers can devise. Harrison Storms, [North American's] Apollo boss put it this way: "One bunch says we don't test enough. Others say, 'Let's get this thing off the ground!' We can't win." Some charge that space is siphoning off bright young men -- leaving other fields starved for talent. For our part, we're glad America has an industry that creates a demand for brains and education. More youths drop out of school for lack of motivation than for lack of money. Of course, we could give up on going to the Moon. Eighty years ago a nation that had just built the world's greatest canal started out to build another one -- across the Isthmus of Panama. The going was tough. The mosquitoes were deadly. The builders spent $260 million -- a lot of money in the 1880s. Someone must have said it cost too much. When the U.S. came along 20 years later, the French machines lay abandoned in the jungle.